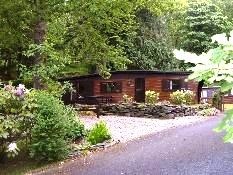 Set on a South facing hillside above Skelwith Bridge, at the entrance to Langdale, Neaum Crag is a wooded estate of some eighteen acres in total. Neaum Crag house was the original main dwelling surrounded by the woodland, with Coach House and kitchen garden. In the late 1800’s a man called Fleming who was a friend of Ruskin occupied the house. The house was extended at that time and developed to look much as it appears today. There was a tower above the roof line, now gone, with windows to allsides which must have given superb panoramic views of the surrounding landscape. The grounds would have been managed and laid out with paths running through the woodlands. The area where the pool hall now stands was a kitchen garden complete with large sundial. Most of the mature native and specimen trees date from this period. As with many such properties the Great1914-18 war altered everything and the house and estate struggled to maintain viability up to 1960 when the whole was sold to the Lake District Planning Board. The Board developed the estate into a caravan and campsite. Pitches for touring caravans were dotted through the woodland and the whole of the upper area was available for camping. 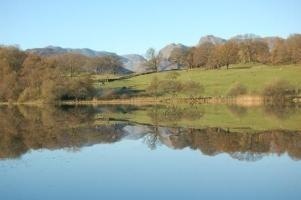 In 1980 thePlanning Board sold the whole site as a going concern to Dorridge Limited, a company which already owned and ran the Wasdale Head Inn. In 1984 the company began installing timber‘mobile homes’ instead of taking touring caravans. ‘Mains services’ were run to each lodge and the properties were delineated by boundary fences. These individual plots were then sold freehold with the chalet and its contents. Each individual owner of property on the estate has one share in the company Neaum Crag Ltd, which manages the site. The Estate Manager’s partner runs a letting agency for property owners who wish to let out their lodge. Please view www.neaumcragservices.co.uk for more information. Apublic footpath runs from the Western end of the pool building down between the steeply pitched roof chalets to Skelwith Bridge. At Skelwith Bridge is a hotel, slate galleries with products for sale and café, and a pleasant ambling path alongside the river up to Elterwater and village. Up the hill from the pool hall the public footpath runs up the steep one way hill and on up the drive to the large overflow car park at the top of the estate. It then follows the same line up through the larch plantation to exit our land through a gate in the wall. Loughrigg Tarn and Loughrigg Fell can be seen to right from this point. The woodland is protected by a tree preservation order and the bird life is well noted. 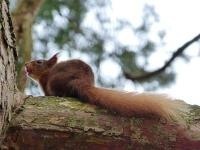 Red Squirrels can be spotted, roe deer, and occasionally red deer,wander at will through the grounds, though they are rarely seen in summer when the vegetation is high, and badgers snuffle around in the wee hours. Observe, admire or ignore as you will, but please do nothing that may alter or interfere. The old adage applies, “Take nothing but photographs, leave nothing but footprints”.